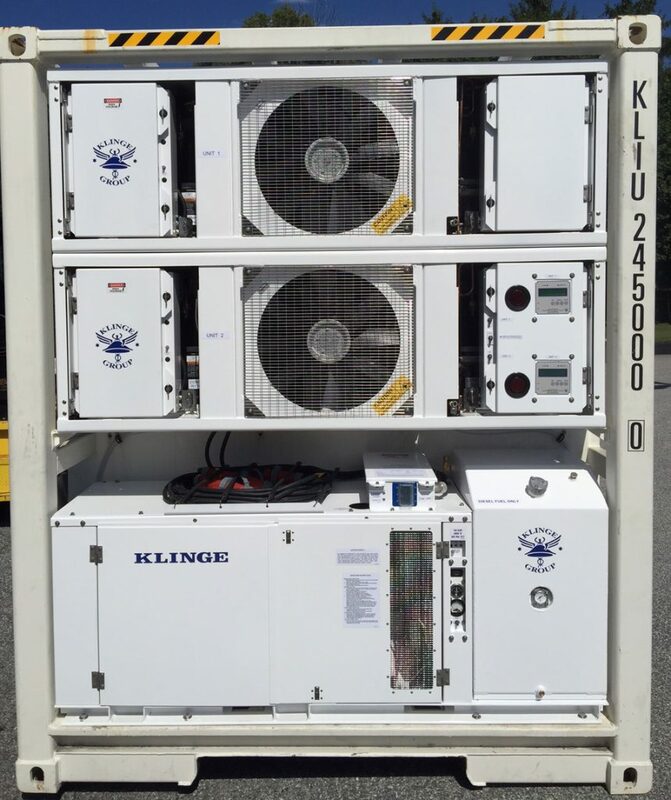 Klinge Corporation’s Deep Freezer Units and Container Systems, Models NMF-371, NMF-371S, and NMF-372, are designed especially for mounting in customer built-in rooms or on insulated containers and can be used for both storage and transport solutions. The freezer units can provide cargo temperature in the range from -20°C to -65°C. The units operate in ambient temperatures up to +50°C. 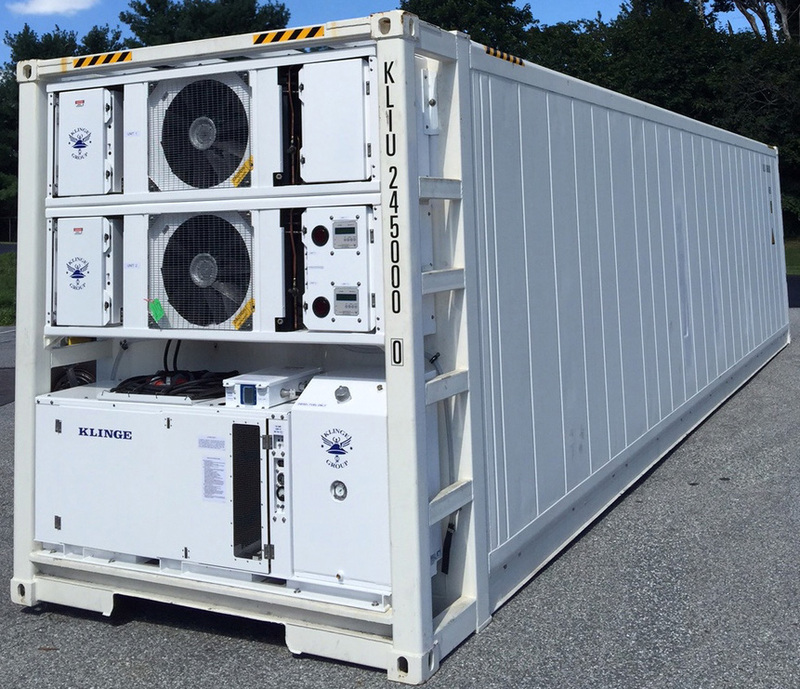 The NMF-372 system includes two independent Freezer systems which act as back-ups to each other in case of failure, thus ensuring that there will always be cooling capacity for your high-value cargo. Similarly, the NMF-371S systems for installation in customer cold rooms can be installed in quantities of more than one for added redundancy. This is particularly critical for pharmaceutical or biopharmaceutical products as even the smallest temperature excursions can lead to expensive and time-consuming evaluations of product viability following these excursions and even to complete product loss. The units are designed to maintain temperatures in the container by automatically cooling and defrosting during operation and in the case of the dual units switching from one system to the other after defrosting so that the components of each system experience a more even “run time”. Power for the unit is 380/460 volt 3-phase, 50/60 Hz. Control circuit power is reduced to 24/28 volt AC. The units are designed for and suitable for transportation over long voyages of deep frozen, frozen or chilled cargo, but can also be used for local storage for production upticks or during freezer repair. In addition, some customers utilize these systems as back-ups in case of catastrophic failure onsite due to extreme weather or other unexpected conditions. Typical applications for this equipment include transport and storage of tuna and other fish products which require ultra-low temperature storage in order to maintain taste and texture when thawed. – Option for two freezer units for redundancy, each fully capable of maintaining the required temperature by itself. -Manual reset control circuit breaker (no fuses used in the system).